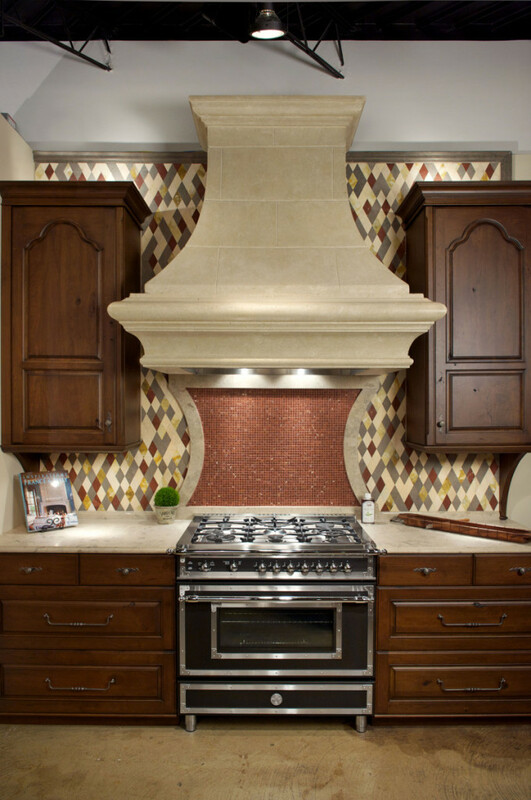 We welcome you to walk through our showroom and discover the endless possibilities available – luxury products, stunning styles and custom conveniences – all on display in each of our kitchen displays. The dazzling diamond-patterned backsplash and stone range hood take center stage in this French-inspired kitchen. 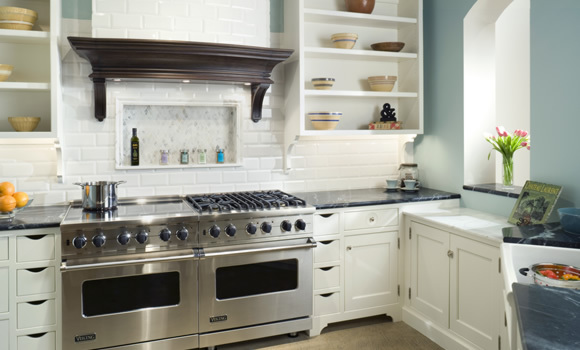 With lots of furniture-style cabinetry, earth tones, warm wood textures and a six-burner luxury range, this hub of the home feels French country, feast-ready and just right. Inspired by the film, “Something’s Gotta Give”, this bright, open kitchen epitomizes the transitional style with its Rutt Handcrafted Cabinetry, fire clay sink, Viking ranges, soapstone countertops and custom hood. The pop of Tiffany blue serves as the exclamation point on this refined design space. From custom glass and concrete work to intermingled wood species to the renewable glass countertop, this show-stopping, fully-functioning bar spotlights the best in eclectic design. It’s roomy, too, with a chilled beverage center, glass and bottle storage and dual recycling compartments built in to the patchwork hutch on the right. 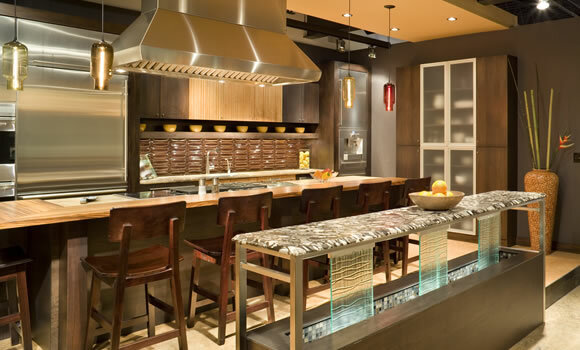 Walk through our contemporary working kitchen and you’ll quickly discover why we call this the pride of our showroom. 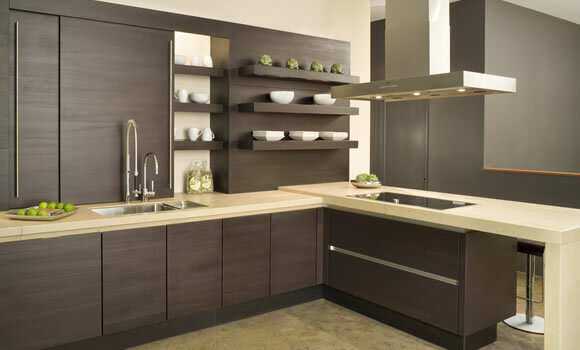 We achieved a warm, Asian-inspired design with cabinetry, cork and zebra wood accents and renewable Lyptus wood cabinetry. With an eye for serious entertaining, we included high-end appliances, a gourmet coffee machine, Travertine countertops, a stainless dish and food pantry and a gorgeous custom fountain at the base of the seating area. 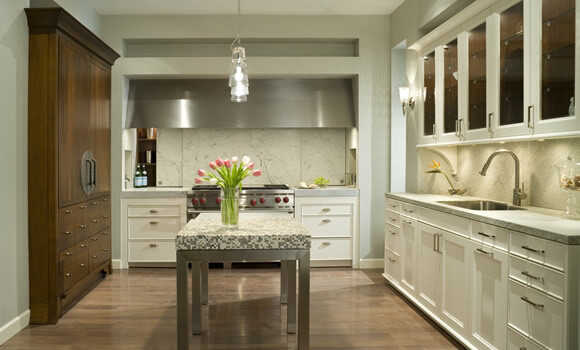 Global technology reigns in this elegant and ultra-functional Beaux-Arts kitchen. From the integrated Sub-Zero refrigerator and freezer units hidden in the armoire to the sleek marble backsplash that hides storage, this kitchen illustrates sharp design at its best. A variety of textures, including granite, glass and wood, work to create a soothing aesthetic, with the soft lighting and sky blue ceiling finishing off the effect. 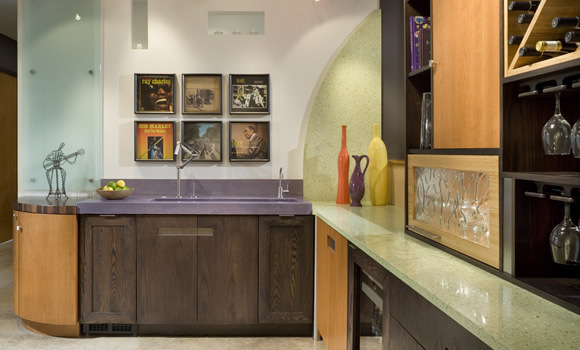 This kitchen boasts the best of European design, with its open shelving, limestone counters and sliding backsplash system concealing storage. The elegant finishes are dark, rich and inviting, and all feature SieMatic’s handle-free system that revolutionized kitchen design almost 50 years ago. Brilliant ideas never go out of style, after all. Due to the nature of our business, the Designers are occasionally at on site meetings and cannot be at the showroom. While we try to assure someone is at the showroom at all times, it is sometimes unavoidable to have our doors closed. Please call prior to traveling to our showroom to assure that there is someone here that can assist you.